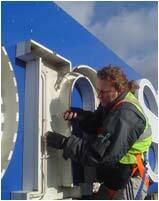 For 50 years Electro Signs has serviced, cleaned and repaired all types of signs across the UK with depots in London, Manchester, Newcastle, Glasgow, Birmingham and Southampton. Whether it be a hotel, theatre or a chain of shops and restaurants our helpful, experienced engineers will ensure that your sign is a safe and bright advertisement for your business. We offer a chargeable repair service or a full maintenance service to suit your needs. Maintaining your sign will help to raise your company's image in today's competitive market.